Red Wine, Green Tea and Dark Chocolate: The greatest dietary mistake of the 20th century....was NOT saturated fat. The greatest dietary mistake of the 20th century....was NOT saturated fat. No it was the wrecked balance of Omega-3 and Omega-6 intake. Dietary fats have become completely deranged in the last 100 years. Enter trans fats. Enter concentrated animal farming operations and feeding soybeans and corn to fatten up beef, pork and chickens. We've run amok. and it is time to correct things. We have a tendency to obsess about fat in our culture. We’ve recently seen an about face in recommendations regarding saturated fat. Saturated fat was the dietary bogeyman for the last few decades and now research is suggesting that it may not be as harmful as we thought. Really? So butter is ok now? Yes and it always has been. Margarine was a health scam perpetrated by greedy oil companies. Greed...oil... sound familiar? But in all of this back and forth on fats in our diet one point remains painfully obvious. Today, people are eating way too many Omega-6 fatty acids. Mostly from corn and soybeans and their oils that dominate the western diet. 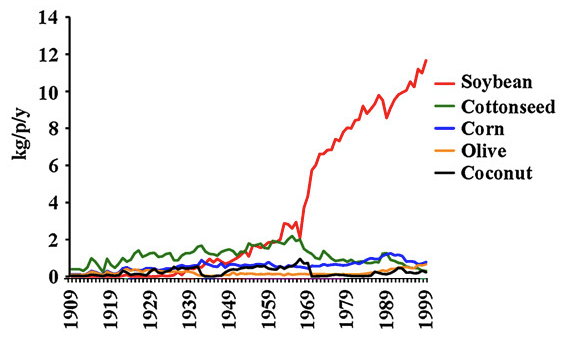 At the same time, consumption of animal foods high in Omega-3 is the lowest it has ever been. To make matters worse the animals we eat are no longer roaming free on the range eating omega-3 rich grass, they are raised on feed lots and fattened up with omega-6 loaded (you guessed it) corn and soybeans. The net effect is we now consume a grossly distorted ratio of these polyunsaturated fatty acids. Setting our sugar insanity aside for the moment, this is arguably one of the most damaging aspects of the modern Western diet. Omega-3 and Omega-6 fats are essential components of the human diet. Our bodies don’t have the ability to manufacture them and therefore we must get them from the foods we eat everyday. Allow me to introduce you to the Omegas. If the Omega-3s and Omega-6s are missing from our diet, we develop a deficiency and become sick. That is why they are termed the “essential” fatty acids. However, these fatty acids are different than most other fats. They are not simply used for energy or stored in tissue; they are biologically active and play crucial roles in survival events like blood clotting and inflammation, brain cell communication, and even regulation of heart rhythm. But here is a problem. Omega-6s and Omega-3s don’t have the same effects. Omega-6s are pro-inflammatory, while Omega-3s have an anti-inflammatory effect. Omega-6s promote unhealthy clotting and narrowing of blood vessels while Omega-3s have the opposite effect. Don’t get me wrong. Omega-6s are not all bad. In the body inflammation is essential for our survival. It helps our bodies fight infection and recover from trauma, but inflammation allowed to go unresolved can also cause severe damage and contribute to disease when the inflammatory response is exaggerated or excessive. Today we realize that unresolved, chronic inflammation may be setting the biochemical stage allowing the development of the most challenging diseases we face today, including heart disease, obesity and metabolic syndrome, diabetes, arthritis, Alzheimer’s, asthma and many types of cancer. Put simply, a diet that is high in Omega-6 but low in Omega-3 increases inflammation, while a diet that includes balanced amounts of these fats governs inflammation appropriately. So again, the issue is that people who eat a typical Western diet are eating way too many Omega-6s relative to Omega-3s. A good way to figure out what is healthy for humans, is to look at populations that are healthy and don’t have all these Western diseases. Good luck finding developed countries that fit that description. The sad truth is, every country that eats an industrial diet gets sick. Our food practices today erode our health and send our health care costs skyrocketing upward. Bully for hospitals and drug companies, but not so great for you and me. Therefore, to find dietary guidance we must look at non-industrial populations like the most recent hunter-gatherers. Hunter-gatherers who eat mostly deer, elk, and other land dwelling animals have a. Omega-6 to Omega-3 3 ratio of 2:1 to 4:1, while the Inuit, who ate mostly Omega-3 rich seafoods, had a ratio of 1:4. All of these populations enjoyed good health. They did not suffer from the chronic diseases we face today. Keep in mind that none of these populations were eating a lot of Omega-6. We need to consider that we will not fix our own health by continuing to consume high levels of omega-6 and simply adding omega-3. Getting a daily small balanced amount of both is probably best. Emphasis on balanced. Anthropological evidence also suggests that the ratio of Omegas human beings evolved with is closer to 1:1, while the ratio today is around 22:1 or worse. Meaning 22 times more omega-6 than what we are genetically programmed to handle. Not only are modern people eating much less Omega-3 from animal sources, they are eating huge amounts of processed seed and vegetable oils which provide ridiculously high levels of Omega-6. The technology to extract seed and vegetable oils is twentieth century technology. Evolutionarily speaking we simply have had no time to genetically adapt to these high amounts of Omega-6. Soy is the major culprit here. Here is a chart that shows the dramatic increase in soybean oil consumption in the USA, from zero to 11 kilograms (24 pounds) per person per year. Soybean oil is currently the biggest source of Omega-6 fatty acids in the USA, because it is abundant and dirt cheap. Don’t even get me started on government subsidies for soy and corn. Thus soy oil, and to a slightly lesser extent corn oil are used in all manner of processed foods. Unfortunately processed foods make up an ever-increasing part of daily food intake in developed countries, so we are literally stuffing our cells and tissues with excessive omega-6. The amount of Omega-6 fatty acids found in body fat stores has increased by more than 200% in the past 50 years alone. So the unbalanced fats that we are eating are leading to structural changes, in our body fat stores, cell membranes, tissues and organs everywhere in the body. Continuing on this path is suicidal. A high amount of Omega-6 in cell membranes is strongly associated with the risk of cardiovascular disease, partly due to the pro-inflammatory effects, but also due to lipid imbalances and unwarranted clotting. There have been several controlled trials where people were directed to replace saturated fats like butter with Omega-6 rich vegetable oils. Instead of having healthier hearts, the dietary changes backfired and they had a significantly increased risk of heart disease. A high Omega-6 intake is also associated with violence and depression, while Omega-3s improve all sorts of mental disorders like depression, schizophrenia and bipolar disorder. Consumption of vegetable oils high in Omega-6, and a precipitous drop in omega-3 levels is simply the reality of food policy and production changes over the past 100 years. There is a tsunami of evidence that this is causing serious harm. Fortunately, optimizing your intake of the most important Omega-3 fatty acids is relatively simple. The single most important thing you can do to reduce your Omega-6 intake is to avoid processed seed and vegetable oils high in Omega-6, as well as the processed foods that contain them. 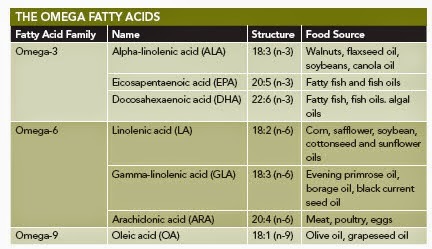 Here is a chart with some common fats and oils. This is why I prefer using olive oil in the kitchen. To reduce your intake of Omega-6 you need to avoid all of these oils that have a high proportion of Omega-6 (blue bars). You can see that all of these plant oils are much higher in Omega-6, relative to Omega-3. In fact Omega-3 in plant oils is virtually non-existent. Mind you I said to reduce Omega-6 not eliminate it. Omega-6 is essential for health, it is the overconsumption, the loss of balance that is the issue. Animal foods are the best sources of the preformed Omega-3 fatty acids, EPA and DHA. And they provide omega-6 too. Think fish and grass fed beef and pork. The problem is that commercially raised animals are fattened up with grain-based feeds of mainly soy and corn. If those grains fatten up cows what must they be doing to us? Feeding soy and corn to cows, pigs and chickens reduces the Omega-3 content, so the fats in the meat are mostly Omega-6. Therefore, if you can afford it, grass fed or wild meat is definitely optimal. However, occasional consumption of conventionally raised meat is healthy, as long as it is not processed. It is also best to buy pastured or omega-3 eggs, which are much healthier than eggs from hens that were fed grain-based feeds. By far the best and healthiest way to increase your Omega-3 intake is to eat seafood at least twice per week or ideally, even more often. Fatty fish like salmon is a particularly good source. Sardines, mackerel, herring and tuna are good choices too. Wild caught fish is best, but eating farmed fish is much better than eating no fish at all. If you eat a lot of conventionally raised meats and/or don’t eat much seafood, then I strongly suggest you take a fish oil supplement. And when you are choosing supplements, please be aware of this. There are some plant sources of Omega-3, like flax and chia seeds. However, these contain a type of Omega-3 called ALA. ALA does not confer the heart, eye and brain benefits of its longer cousins EPA and DHA. And humans are inefficient converters of ALA into the active forms, EPA and DHA. So be sure you either eat fish or take a supplement that provides EPA and DHA. Adults need between 1000 and 4000 mg EPA/DHA daily and children under the age of 10 need 200-1000 mg EPA/DHA daily for best results. Teenagers should be dosed as adults. 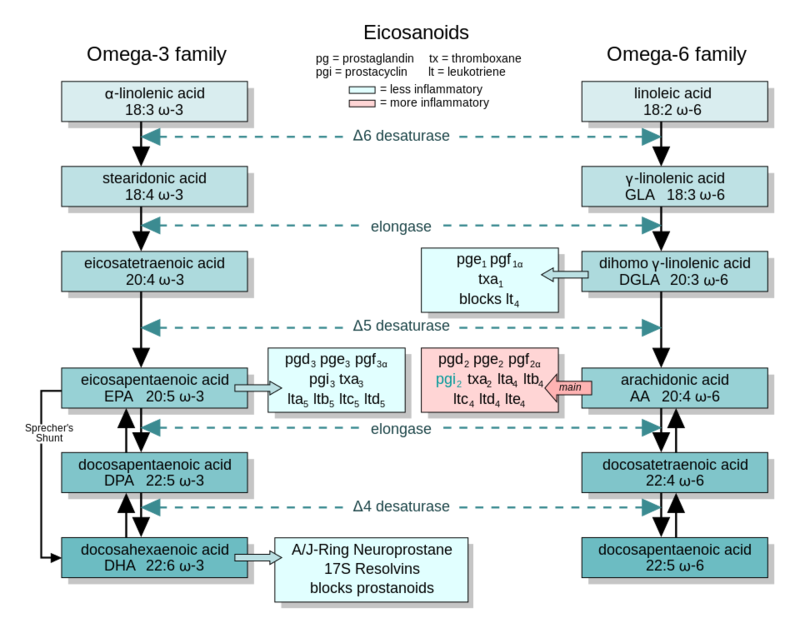 And finally for the geeks in the room, here is a nifty chart showing the metabolic pathways of Omega-6 and Omega-3s.